If you’re not doing it already, you may want to add the 26th September to the list of annual celebrations in your school: the European Day of Languages. Look around your staff room or classroom. How many languages can you spot? I’ve got English, Polish, Russian, Italian (x2) and French. 5 of the 24 official EU languages in the 30 or so square metres of our office. And these are just the ones I know about! What is European Day of Languages? The European Day of Languages was established in 2001 by the Council of Europe as a celebration of linguistic and cultural diversity in Europe. This year tens of events introduce children and adults to the richness of European linguistic heritage and highlight the importance of language learning in developing intercultural competencies – vital skills in today’s globalised and interconnected world. Apart from a few exceptions, such as Belgium or Switzerland, majority of the European states are largely monolingual, and learning other languages is explicitly embedded within their educational systems and policies. 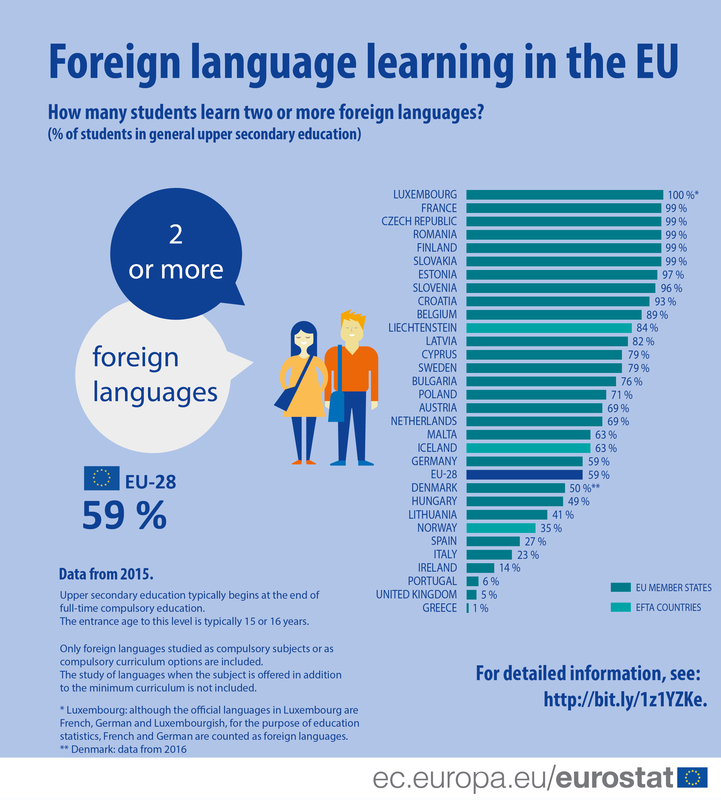 A look at the 2015 statistics reveals that on average 59% of students aged 15-18 in the EU were studying two or more foreign languages. According to the 2017 Eurydice report, Key data on teaching languages at school in Europe, learning English is compulsory in 18 of the EU education systems – and regardless of that at least 90% of students in lower secondary study English. As the data was based on compulsory languages education, the UK placed second from the bottom, with the 5% measure outperforming only one other country. Another survey, this time conducted by Confederation of British Industries, and supported by Pearson – highlighted a dire need for boosting language skills of UK school and college leavers, with the European languages firmly topping the demand charts: French (51%), German (47%) and Spanish (45%). Only a third of surveyed companies thought that the language skills of those entering the jobs market were good enough. That sentiment is very much in keeping with the findings in a report by the Teaching Schools Council, which states that of those choosing languages at GCSE level, only a third achieve grade C or above. In that context the recent policy announcement by School Standards Minister Nick Gibb to make foreign languages a priority shouldn’t come as a surprise. Supported with a pledge of 4.8 million pounds over the next 4 years, the programme will set up a national language centre and nine school-based language hubs, which will work with local schools to improve the standard of teaching foreign languages. Implementation of the insights from the Modern Foreign Languages review will be fundamental to improving the quality of teaching, and as a result general foreign language proficiency levels in England. The Pearson Edexcel International GCSEs give students a much wider choice of options, reflecting the global dimension of the qualifications with languages such as Chinese, Bengali, Hundi, Gujarati or Swahili. Apart from pretty much all of Europe learning English, there is another commonality in the teaching and learning languages in Europe. It would be difficult to compare the state of language learning across the different educational systems without a common benchmark – the Common European Framework of Reference for Languages: Learning, Teaching, Assessment (CEFR). First introduced in 2001, it uses level descriptors (commonly known as the “can do” statements) to define six levels of proficiency: Basic User (A1 and A2), Independent User (B1 and B2), and Proficient User (C1 an C2) and can be applied to any language. It has since become widely adopted as a standard outside of Europe. Currently two thirds of countries in Europe use CEFR as the benchmark for describing the expected proficiency level for students at the end of secondary education, and the Bologna process, which aims to ensure comparability of higher education systems across the 48 member states of the Council of Europe, will only strengthen the role of a common set of standards for languages. Pearson have involved 6000 teachers from more than 50 countries to extend the CEFR for English, providing a more granular picture of what needs to be mastered within each of the four skills on the 10-90 Global Scale of English (GSE). The GSE Toolkit is a free, online, searchable database, including the Global Scale of English and thousands of Learning Objectives, Grammar Objectives, Vocabulary items and Collocations. And what about your school? What is the attitude to language learning among the students? What languages are most popular? To celebrate the European Day of Languages, try out the activities from our well-known MFL resources, Viva! (Spanish), Stimmt (German), and Studio (French). Sign up for a free 60 day trial of the online subscription on ActiveLearn Secondary. What do students need to break through the grade 4 "ceiling"?